Yes I've seen the photo. If you haven't seen it, then you will have to look elsewhere for it because I will not be throwing any kind of support behind this new "RoboCop". Paul Starship Troopers Verhoeven crafted a outstandingly violent tale of a man who became a robotic Judge Dredd melded with Dirty Harry and armed only with a simple set of 3 rules and a machine pistol redefined justice for cinema goers in 1987 and it cannot be remade. To think that a violent science-fiction movie is all RoboCop is however then you've either not seen it enough or it's been to long since you've seen it [the third option - that you've not seen it is literally a crime around here]. You see - RoboCop is set in Detroit for a reason - the same reason that the city is not thought of in glamorous terms even today, a place of little prosperity, high unemployment and urban crime. The movie explores the gamut of humanity; emotion, immortality, greed but most importantly - identity. RoboCop was also a satirical look at some elements of Reaganomics but especially the rise of media that can all too easily be used to sway or even change public opinion. A brewing World War III is mentioned briefly by a newscaster on a channel that later uses 60 seconds of airtime to advertise a family oriented nuclear destruction themed board game. 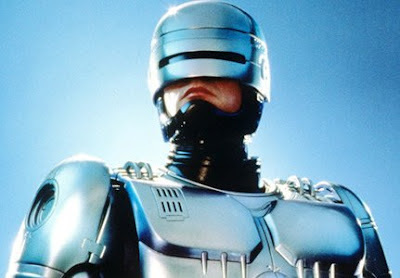 RoboCop is my favourite movie of all time. 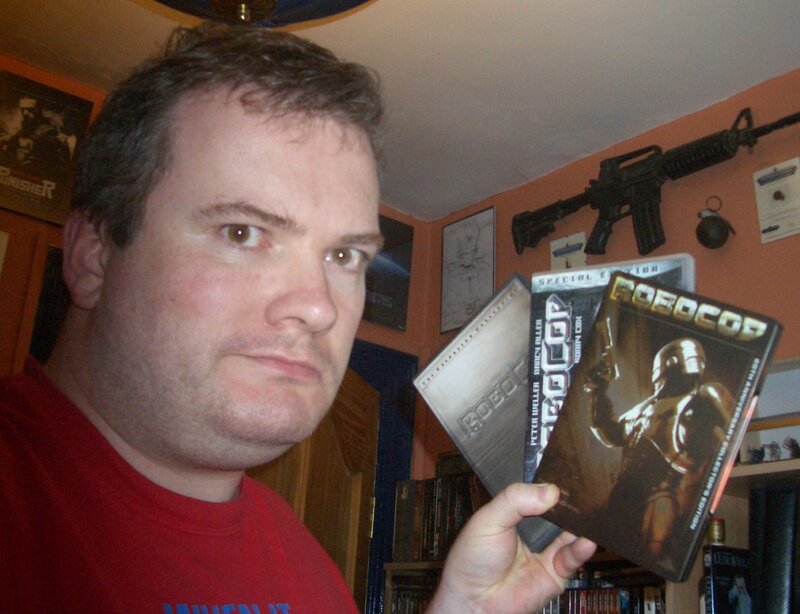 I've helped fund the statue they're erecting in Detroit and I own three different DVD copies [above] containing different cuts, different qualities and presentations in different aspect ratios just to experience everything in different ways and analyse it even more than I have done so with my religion - Star Wars. The reason for this is because I know that each time I look upon something so undeniably perfect in every way I find answers to many of my own questions. While I enjoyed the Brazilian move Tropa De Elite which he directed, I do not believe that José Padilha has the talent to make little more than a shadow of the the original RoboCop as even The Empire Strikes Back director Irvin Kershner himself could not make even a passingly good sequel to the original in 1990. It is because of this that I will not see this 'remake', so I care nothing about the Dark Knight-esque, G.I.Joe 'accelerator suit' inspired new RoboCop design, nor do I care to be informed about the latest Robo-rumours from your favourite websites. I choose not to comment further on RoboCop  because for me it will be as if it doesn't exist. You would have thought that the poor performance of the other Verhoeven remake, Total Recall, would have made them rethink. Who knows maybe the remake of Showgirls will be a classic, just as long as someone plunges a metal spike of some kind into some ones neck. Yeah saw the "picture" and thought, weak, exceedingly weak. It just looks looks like a guy in an armored suit, I mean we already have Ironman for that particular shtick, whereas the original Robocop, actually appeared quite machinelike, like there just simply wasn't enough of poor Officer Murphy left to put in an armored suit, no, he was truly fubared, he had to be rebuilt from the ground up, so much so that he even looked more of a genuine cyborg than Lord Vader ever did. The new guy looks like someone cut of the Tick's antennai and painted him black. Just plain lame.